So many college graduates leave school carrying an enormous debt burden. Article after article makes the sobering observation that many graduates risk being crushed by its weight. As Suzanne Mettler makes clear in Degrees of Inequality: How the Politics of Higher Education Sabotaged the American Dream, that it’s not “just” debt that is tarnishing our once-unparalleled system. Given the changes in higher education policies, students from the wealthiest families are graduating at higher and higher rates, while graduation rates are less than 15% for students from lower income families. Financial constraints are the major hurdle, forcing many students who enroll in college to leave before they complete their degrees. For-profit colleges are proliferating, but they aren’t delivering the skills and jobs that they advertise. Their costs are significantly higher than public and private nonprofit institutions, and graduates leave with a level of debt that is often unbearable. The growth of for-profit colleges and changes to financial aid policy at both the state and federal level have benefited banks and corporations far more than students looking to education as a path to advancement and opportunity. The media has done a good job of reporting on current trends, but there has been little to explain how we got here. How has a nation with a history of innovation in education, and nearly unanimous support for higher education among both politicians and the public, gotten to this point? Suzanne Mettler suggests that the explanation can be found in the obstacles to creating bold policy initiatives today. Adapting existing policy to current social realities is much different than creating policy anew, and is vastly complicated by the current political climate. By focusing on this perplexing dynamic, Graduating Inequality offers a new perspective, as well as some examples of where reform is possible. In Degrees of Inequality, Suzanne Mettler – an articulate observer of the political process – provides a new way to think about one of the most pressing issues of the day. We’re having the wrong conversation about higher education in our country. So argues Suzanne Mettler in her provocative new book…. [A] thoroughly researched argument that leaves one both a little bit smarter about how politics work in this country and also very worried about a college and university system so clearly in crisis. — Gary Rivlin, The New York Times Book Review. The long-running debate on higher education in America is masterfully served by Cornell political scientist Mettler’s carefully researched study, which roams between history, polemic, and analysis with aplomb while championing the positive legacy of equal opportunity in education. Mettler delivers a broadside to for-profit universities and the politics that enrich them. The author spent eight years researching and writing her withering attack, and her data is devastating…. A thorough and deeply troubling analysis of a quiet but ominous threat to democracy. Reform is past due, and Mettler’s well-researched book needs to fall into the hands of those who will read, heed, and rally for change. [A] provocative new book…. Mettler argues that this drift in public policy over the past quarter-century — in Washington and in statehouses — has exacerbated gaps between the haves and the have-nots, undermining the ideal of college as an engine of upward social mobility. [A] timely and thorough discussion of unequal access to higher education…. This work is essential for students of programs in higher education policy, government, and political science as well as anyone interested in the current state of higher education. 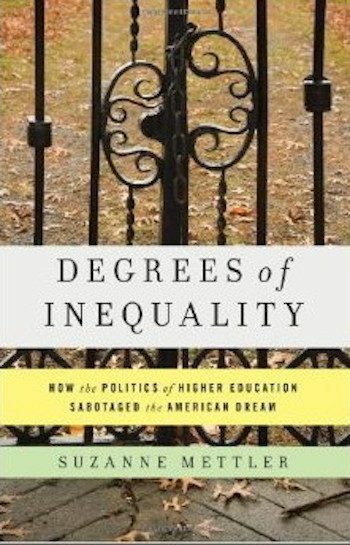 Degrees of Inequality is a trenchant analysis of how our severely dysfunctional politics has undermined one of the foundational pillars of the American Dream. Mettler powerfully and convincingly demonstrates how partisan polarization and plutocratic biases have shaped higher education policy in recent years and why reform is so urgent. An engaging and essential read for citizens and policymakers alike.